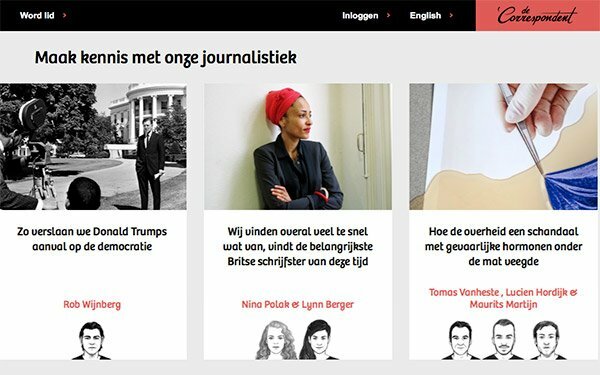 Reader-funded, Netherlands-based news site De Correspondent has raised $950,000 from Omidyar Network to help launch an English version of the Dutch site that will be based in New York. De Correspondent has raised a total of $1.8 million for the English-language expansion. Omidyar Network is an investment firm created by eBay cofounder Pierre Omidyar. The firm also funds First Look Media, The Intercept and Honolulu Civil Beat. De Correspondent launched in 2013 with a crowdfunding effort that raised $1.7 million from about 19,000 backers. The site now has 60,000 paying members and is ad-free. About 85% of its revenue comes from readers, memberships and events, cofounder Ernst-Jan Pfauth told CJR. Pfauth added the latest round of funding will support a marketing campaign for De Correspondent’s expansion and find new members for its English version. The campaign will be led by Blue State Digital, the agency behind Barack Obama’s digital campaigns for president, and Momkai, a Dutch design firm and founding partner of De Correspondent. Pfauth told CJR he hopes to build a U.S.-based editorial team with an estimated five to 10 full-time reporters. De Correspondent has about 20 writers, and Pfauth said it is "close to being profitable." New York University professor Jay Rosen is advising De Correspondent's U.S. efforts and studying member-funded journalism.